In order to run an industrial plant or commercial facility successfully, you will need to rely on many different pieces of equipment. However, one of the most important things that you’ll need to maintain a safe working environment for you and your employees is an industrial fan. Industrial fans can take stale, contaminated air from inside your facility and move it outside so that you can replace it with fresh air. By doing this, you will enjoy many benefits that come along with using an industrial fan. The first thing that an industrial fan will do for your facility is remove dirt, dust, debris, and other contaminants from the air. If you are running a plant that is constantly filled with dust due to a product you are manufacturing or processing inside, an industrial fan will help reduce that dust and make the plant cleaner as a whole. 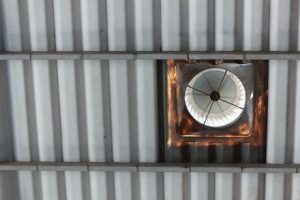 The second thing that an industrial fan will do for your facility is cut down on the health risks associated with allowing dirty air to hang around for too long. Often times, it’s not safe for your employees to be exposed to dust particles and all of the other things in the air in your facility for an extended period of time. Even if they wear masks and do their best to keep contaminants out of their lungs, they are eventually going to be subjected to them if you don’t have an industrial fan installed. Industrial plants are usually filled with chemicals, vapors, and more in the air, making an industrial fan a necessity. In addition, the third thing an industrial fan will do for your facility is help you to meet OSHA’s strict regulations. OSHA’s regulations require you to keep your plant as clean as possible at all times, which can be pretty much impossible without an industrial fan. And if you don’t meet their regulations, you could face fines, shutdowns, and other penalties. Your industrial fan system will show that you are taking the right steps to adhere to what OSHA tells you to do. Dynamic Fan understands the importance of installing industrial fans inside of commercial facilities, and we have almost 30 years of experience with doing it. We can also help companies do industrial fan maintenance and make fan repairs when necessary. If you are interested in installing, repairing, or maintaining a fan in your facility, call us at 973-244-2422 today for more information.